Allu Arjun, Mahesh Babu’s films to release on April 26 to avoid clash with Rajinikanth – Will this work? Allu Arjun, Mahesh Babu's films set to release on April 26 to avoid clash with Rajinikanth. April 2018 is going to be one of the biggest months in South cinema as not just one, but three BIG releases will hit the theatres. 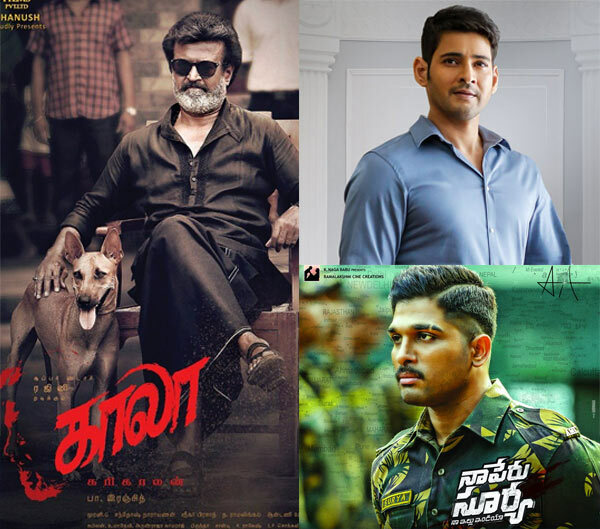 The movies in question are Rajinikanth’s Kaala Karikaalan, Allu Arjun’s Na Peru Suryaa and Mahesh Babu‘s Bharat Ane Nenu. In all fairness, Allu Arjun and Mahesh Babu had locked in on this release date first. It was only later that Rajinikanth had announced the same date for 2.0. As per the latest update, 2.0 is no longer releasing on the same day, but Rajinikanth‘s other upcoming film – Kaala Karikaalan is! Post this announcement, the producers of Allu Arjun and Mahesh Babu’s films have maintained their stand and confirmed that their films would release as planned on April 27. Just when we were getting ready for a clash, the makers of both the movies have now announced their new strategy – Allu Arjun’s Na Peru Suryaa and Mahesh Babu’s Bharat Ane Nenu will come a day earlier i.e April 26, 2018. While both films will have an edge of some sort and are essentially Telugu, is this the best strategy they got keeping Rajinikanth’s release in mind? Mahesh Babu and Allu Arjun are returning to big screen after two average releases – Duvvada Jagannadham and SPYDER. In fact, the latter was one of the biggest disasters of 2017. If both stars want their films to be a huge commercial success – a clash with Rajinikanth is best avoided. Because the universal truth is – he is a superstar across all industries. Period. Allu Arjun's 'Badrinath': Costliest Telugu film ever made?